LEAWOOD, KS (November 18, 2015) – Two of CARSTAR’s long-time owners, Jeanne and Jeff Silver of CARSTAR Mundelein in Mundelein, Illinois, took home the industry’s top honors during the recent SEMA show in Las Vegas. 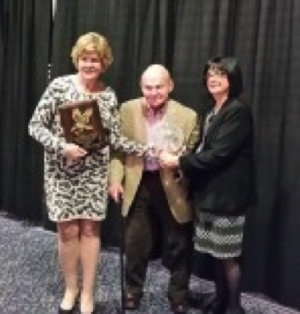 CARSTAR Mundelein co-owner Jeanne Silver was named to the collision industry’s Hall of Eagles, the first hall of fame inductee since 2012. She joins her husband, shop co-owner Jeff Silver, in the hall. Jeff Silver was inducted in 1993. Jeff Silver won the I-CAR Chairman’s Award, which recognizes an individual or organization whose contributions to I-CAR have been significant or extraordinary. The Chairman’s Award recipient is selected by the Executive Committee of the I-CAR International Board of Directors.